As a counselor, taking notes is one of the most important parts of my job. The details shared with me in a counseling session are sensitive and critical, so I want to capture what I can. I also hear a lot of information over the course of many cases, so taking notes helps me keep the details straight. I want to be sure to capture the vital information conveyed, as well as the intuitive items I may deduct as people share their stories. When I first started counseling, I struggled with note taking. I haven’t come across an excellent book on the subject, nor has it been taught in any counseling course I have taken. Therefore, I was motivated to develop the template I have included in this post. Through extensive trial and error and a thorough review of many different counselors’ session notes, I created the counseling note template. I found the similarities they all seemed to have and made sure to include those in my notes. I also added a few essential items I recorded in every session and created a note-taking template. I tried it for several months, making tweaks along the way, until I found what worked best. The order of every item on this sheet was specifically placed according to the order in which I conduct my sessions. Start time: Tracking the time the session begins shows whether I started on time and if I am maintaining the allotted session length. Significant Observations: I make observations about how counselees look or are carrying themselves (i.e., sleepy, disheveled, rested, happy, depressed, scattered, angry, etc.). Review of the Homework: If there was homework given in the previous session, I take brief notes about whether it was completed and how it went. If the assignment was not completed, I ask several questions to see why and note those here. Prep for the session: This is the only part filled out before the session. I note the things I think should be covered from last time and any specific goals I may have for the session. In solution-based counseling it can be important to have some thoughts prepared before the session begins, though I do hold the goals loosely. Flow of the session: I take notes as the session flows; it’s like I an outline of the conversation. As a rule of thumb, I believe there should be something on the page for every 10 minutes of the session. I note turns in conversation as section titles with bullets underneath. Main Issue for the Session: I am typically able to identify the main problem for the session by the end of the first page. This helps me understand what we are trying to solve. The session issue may be related to the overall issue we are working on, or it may be a new issue. It can be helpful, as I am looking back over all my notes, to quickly see what we have considered primarily in each session. Substance abuse: This is a simple “Yes” or “No” if they are using a substance as a coping mechanism. Current Danger Potential: “SI” is for Suicidal Ideation; “HI” is for Homicidal Ideation; The other two—harming self or harming other—is for any thought of harm that is not death related. I can write “Other” if there seems to be danger potential. Next Action and Homework: I list any next actions that I will take, or they will make, related to the session conversation. I also record any homework assigned. Phone call between sessions? : If I plan on making contact in between sessions, I list it here. In order to jog my memory, I may write specifically why I think additional contact is necessary. Insight or supervisor consult needed? : If I am stuck on something and need to bring it up at our team meeting or to my supervisor, I will list it here. My supervisor does not see this; it is merely a reminder for me to follow up, and the reason is listed. Signature: I sign when the notes are done and complete; this serves as a witness to all that is enclosed. My signature is a sign of a satisfactory job and an acknowledgment of truthfulness. End time: Listing when the session ends shows the length of the session and whether I ended on time. All of my notes are then placed in folders, chronologically, and locked away under code and key. I reference the counseling notes before the next session to make sure I am prepared to help a person as much as possible. If I do not take notes, I believe I am not serving the counselee as well as I could be. 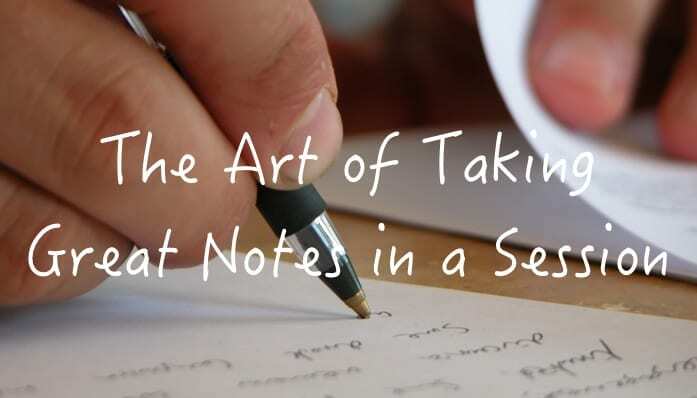 Effective note taking is a skill worth mastering as a counselor if you are going to maximize your time with your counselees and provide quality services. Download your Free Counseling Notes Templates by subscribing below! You’ll receive couseling notes instructions; one Word template, one Evernote template; and one fillable PDF. We’ll also send you future relevant content from JoshWeidmann.com and you can unsubscribe at any time!